Do you have mild symptoms of tingling, numbness, loss of feeling or strength, or pain in a wrist or hand? It might be carpal tunnel syndrome. You can start nonsurgical treatment right away, which includes rest, stopping activities that may be causing the symptoms, and the use of a wrist splint at night. The carpal tunnel is a passageway of ligaments and bones at the base of the hand. Tendons in the hand that become irritated can pinch one of the primary nerves in the wrist – a condition called carpal tunnel syndrome. The condition primarily occurs in adults, and women are three times more likely than men to develop carpal tunnel syndrome. People with diabetes or other disorders that directly affect the body’s nerves are also at high risk. In some cases, no cause can be identified. However, the condition is often the result of a combination of factors, including trauma or injury to the wrist, rheumatoid arthritis, mechanical problems in the wrist joint, work stress, and repeated use of vibrating hand tools. Contrary to public opinion, there is little evidence to confirm that repetitive or forceful movements of the hand and wrist will cause carpal tunnel syndrome. Usually, symptoms start gradually, with burning, tingling or numbness in the hand and fingers. Initial symptoms are often experienced at night when many people sleep with flexed wrists. As the condition worsens, symptoms are experienced during the day with more severe sensations and pain that can make it difficult to form a fist or grasp small objects. In addition to physical examination, providers use a variety of tests to diagnose carpal tunnel syndrome. Some tests try to produce the symptoms of the condition by tapping or pressing on the patient’s wrist or by having the patient press the backs of their hands together. Tests referred to as electro-diagnostic may also be used to measure the electrical activity of the wrist or the speed with which nerves transmit impulses. Initial treatment involves resting the affected hand and wrist, and avoiding the activities that may cause the condition to get worse. Pain medications are often prescribed, and in some cases, corticosteroids (such as prednisone) can be injected directly into the wrist to provide immediate (but temporary) relief. Many patients will ultimately require surgery, either open-release surgery (the more traditional procedure) or endoscopic surgery (a procedure that employs a tiny camera used by the physician to view the inside of the wrist). Both surgeries consist of making an incision in the wrist and then cutting the carpal ligament, which enlarges the carpal tunnel. Both procedures are performed under local anesthesia, and neither surgery requires an overnight hospital stay. If properly treated, recurrence of carpal tunnel syndrome is rare, and full recovery is achieved by the majority of patients. If you think you might be a victim of carpal tunnel syndrome, non-steroidal anti-inflammatory drugs (NSAIDs) could help relieve symptoms. If your symptoms persist, count on the Florida Spine Institute for advice and treatment. Carpal Tunnel Syndrome Fact Sheet (NIH Publication No. 12-4898) (2012). National Institute of Neurological Disorders and Stroke. 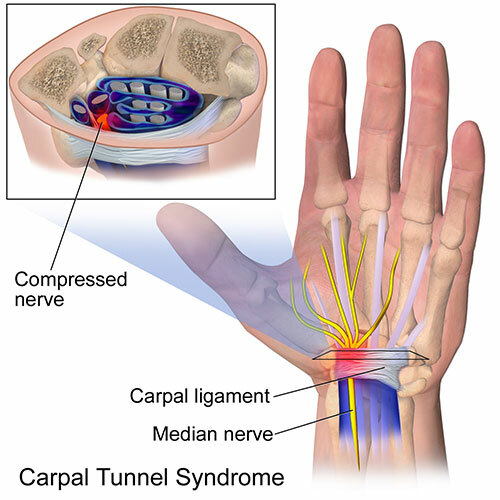 Available at: http://www.ninds.nih.gov/disorders/carpal_tunnel/detail_carpal_tunnel.htm. Last accessed December 4, 2014.